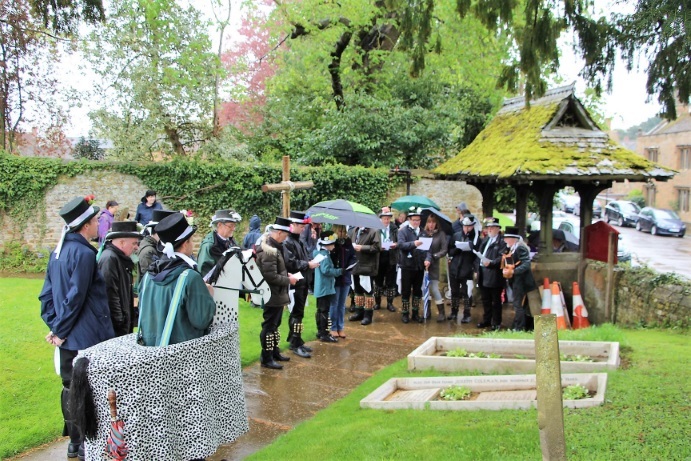 Proceedings started at 10.30am in the graveyard of St Mary’s, Adderbury where the side honoured the contribution of Charlie Coleman, a survivor of the pre-World War One side, who was able to pass on memories of the Adderbury dances to Bryan Sheppard and Jim Plester founders of the revival side in the 1970s. AVMM honours the contribution of Charlie Coleman, a survivor of the pre-WW1 side. Dancing commenced in Church Lane and continued throughout the day at a number of pubs and landmarks around the village, including Lake House where the carers and residents enjoyed a performance of five of our dances. Although the weather wasn’t entirely hospitable, the day was a very happy and memorable one with an excellent turn out of dancers and a large crowd of friends, families and supporters, some of whom had travelled great distances to join us. Many favourable comments were heard about the high standard of dancing. Tribute must be made to all those members who worked so hard during pre-season practices in The Tithe Barn and particularly to Dave Reed, who patiently passed on constructive tips on the dances to new recruits and more experienced dancers, all of whom are keen to improve the standard of our performances. We were delighted to welcome our youngest new member, Xavier Peissel, just two weeks old, looking resplendent in new green baldricks (picture above in the front row). He later accompanied proud father Damien in our Drinking Jig outside The Bell. 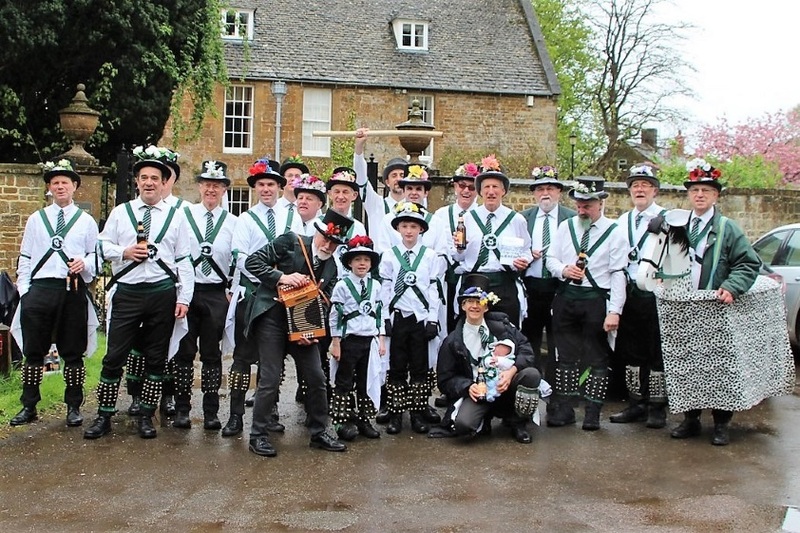 We welcomed some Morris dancers who had travelled down from Yorkshire and are fans of the Adderbury Village dances. With other invited guests, they made up a set of no less than 24 dancers for Brighton Camp. A fine lunch was provided by Tony at The Coach and Horses, where we danced and entertained the locals with the singing of Come Landlord Fill The Flowing Bowl. A total of 52 dances were performed during the day covering our entire repertoire with two sets for The Happy Man and Postman’s Knock (twice) and three sets for a number of other dances. It was good to see Bill Plester come out of retirement to dance with son Tim at Le Hall Place, where we were provided with an excellent tea with a fine selection of cakes by our friends from Sharp and Blunt. The day ended with all three local sides taking turns to dance outside The Bell and a final performance of Brighton Camp led by AVMM with guest dancers and musicians from the other sides joining our regular musicians Donald and Malcolm. Special mention must be given to Troy and Ryan who danced superbly, performing the very demanding jig Jockey To The Fair at each of the three local pubs, also to our youngest dancers, Alfie, Theo and Dylan who showed enormous enthusiasm and energy and were keen to tackle all of our dances and are surely the future of the side for many years to come. Thanks to all who made this such an enjoyable Day of Dance. It was certainly a day to remember.